Morwyn, how do you describe your beadwork? 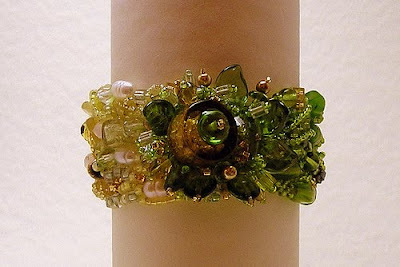 I refer to my work as beaded art, wearable and/or superfluous. I’m a folk and I make art, so what I do is folk art. From Another Country. AnotherCountry: I gave this name to my studio when I started doing bead art in earnest. It’s the home I have made for myself in a world where I have never felt at home. All of us have experienced a sense of alienation, of not belonging, at some point in our lives. I have felt this always. I have loved being on the move, to the point of being an addict to change, always searching for that home outside of myself. I love being here in the Southwest, but as always I never feel a sense of belonging to the physical place where I am. 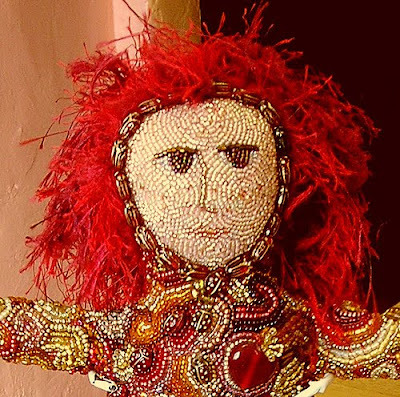 When I am deep in the creation of an art piece, whether it’s jewelry or an art doll or a bead journal page, then I feel at home. Home for me is within, not without. I don’t have a set way of beginning, as I get my inspiration from all over the place. Each piece has a different genesis, but once I start a project with a generalized sketch, it goes like this: pick out a bunch of materials I think will express the concept I’ve formed, thin it down to something manageable, then begin assembling the piece, with a lot of discarding, rethinking, replacing and reworking as it progresses. I’ll keep at it until it’s what I want it to be. If I’m having problems, that’s when I really dig in my heels and beat my head against a wall until I solve whatever design issues I’ve run into. I work in short bursts and in marathon sessions and I usually set a (flexible) deadline for completion. I work best when I’m at the dining table with episodes of old sci-fi shows running on the DVD player – Star Trek TNG, Firefly, Babylon 5 – doesn’t really matter which. 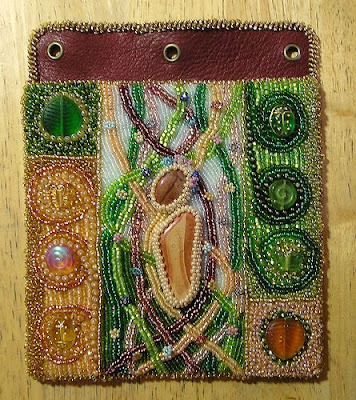 My favorite medium is bead embroidery, with freeform peyote running a close second. I’ve been a crafter all my life. When you grow up poor, you have to make your own fun. I loved my Barbie doll and taught myself to sew, knit and crochet when I was 12 so I could make clothes for her. I’ve been blessed with the ability to read directions and teach myself just about anything from a book. I took advanced tailoring classes in high school and worked for a while as a seamstress. I taught myself embroidery and needlepoint, paper arts and book making. 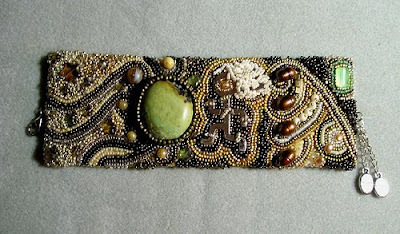 I took up wire wrapping, jewelry making and eventually beadwork about 14 years ago. I did my first craft fair 12 years ago and had so much fun, I just couldn’t stop. For materials, I can’t imagine not having my seed bead stash. I’ve been building it for a very long time and it’s substantial – over five hundred colors in various sizes and finishes. I can’t say that there’s any one tool that I couldn’t do without. I have my preferences, of course, like most beaders – Dritz beading needles (the short ones), Nymo thread, Thread Heaven, an emery strawberry to sharpen my needles, a leather thimble. I’m not so much inspired as compelled to create. It’s a way of communicating in a different dimension. Through art we share something deeper than opinion or attitude, the minutiae of the mundane or our surface lives – we share our individual, unique visions that come from a deep, communal wellspring of creation. It connects us. When you throw everything you know, every skill and every ounce of passion you have into the creation of a piece, just knowing you gave it your all can be reward enough. But, when someone really understands your work and appreciates it, there’s no way to describe that feeling of vindication, of acceptance, of joy, of connection. I’m the person who sits down with a box of twisted necklace chains and picks them apart, no matter how long it takes. I have been known to do this for hours. The challenge of unraveling puzzles, solving problems, it’s exhilarating to me. I think the real key to improving one’s level of artistry has to do with raising one’s level of personal investment in that art. It’s the difference between sunflower patterned wallpaper and Van Gogh’s Sunflowers. Get out of your own way, don’t be afraid to fail, and just let the work take you over. Running a used bookstore, which I own with my partner Asa. I love books with incredibly complicated plots, like Carlos Ruiz Zafon’s Shadow of the Wind. I love smooth jazz, strong coffee, Japanese gardens, Chinese food and California wines.